Trying to plan a simple dinner with friends can be a hassle. Coordinating with multiple persons and making sure everyone is satisfied on where and when to meet is one of the reasons. Constant inflow of message and having to look up responses inside a group chat is another among many. 1. 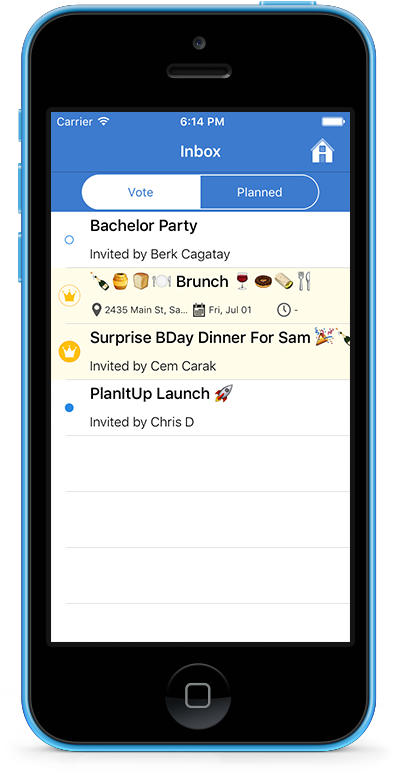 Plan an event with 1 or more options for date, location and time, and invite your friends even if they don’t have the app yet. 2. Receive events in your inbox and get on voting anonymously on what you love. No more hard feelings among friends! 3. Once majority decides where and when to meet, opt in to go or not. PlanItUp is a social mobile application that brings planning to a whole new level. Its user friendly interface makes visualizing information very easy while its functionalities make planning hassle free and quick. Not sure exactly where or when to meet? 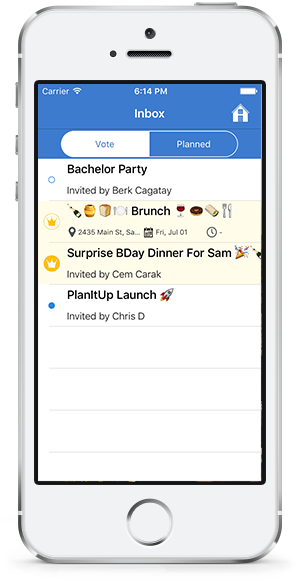 Just provide up to 3 options for date, location and/or time for your invitees to vote. This way, you get help planning from those important people, your friends. Participate in the planning process with others invited. Vote on date, location and time options sent by the host based on your availability and/or preference. Don't worry. Your vote is safe with us. No one will know including your friends. Invite whoever you want. There are no limits. The more the merrier. Just make sure you are at least 2 people. Don't try to find addresses, people's name, date, times or who is coming or not in long group chats. Just open the event and you will have it all organized neatly in once place. 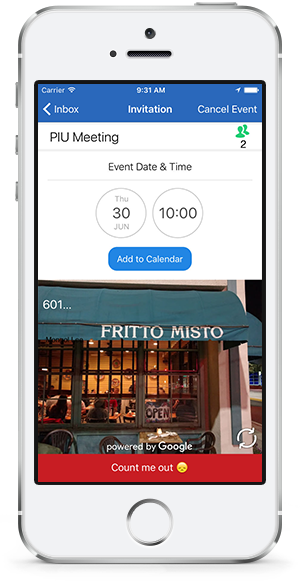 One tap lets you add the final event to your calendar so you can make sure it is accounted for in your busy schedule. Tap the picture or the map on the final event to automatically get directions to your destination. Name your event. Emojis are welcome and highly encouraged. 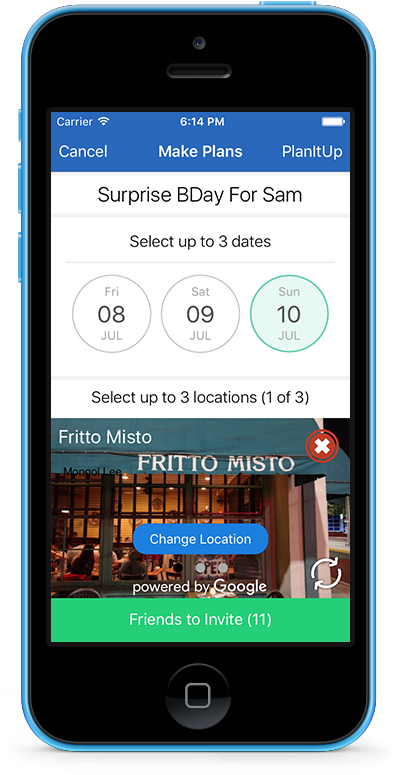 Pick 1 or up to 3 dates for your event by tapping on the bubbles. 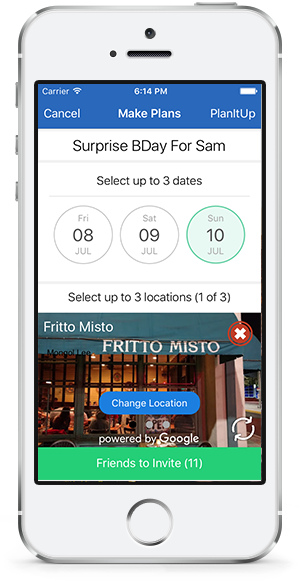 Pick 1 or up to 3 locations for your event by swiping right/left on the map/picture. Pick friends to invite to your event. 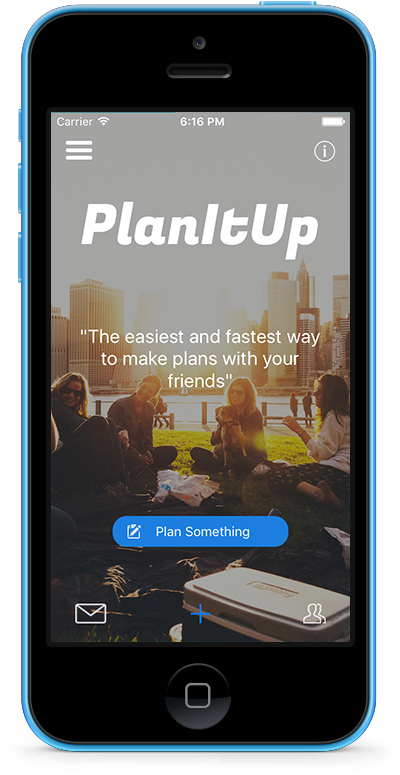 If they have the app already, use the "PlanItUp" section. Otherwise, invite them from "All" section. Everything set? Cool. Hit PlanItUp on the top right to start planning. The "Vote" section contains all your events with voting going on. A filled shape next to the event name means you need to go in there and vote. The "Planned" section contains all the final event where the date, location and time have been decided. Go in there to let others know you are coming or not. You can also access other key features for your event. Pick 1 or more date if options have been provided. You have to eliminate at least 1 option. So if you have 3 options, you can pick 2 if wanted. Swipe right/left on the picture/map to pick a location by tapping on the button. Again, you might be able to pick more than 1 option in some cases. Have you picked your favorite dates and locations? Cool. Press vote and wait for results to be announced. If you don't like any option, you can still just vote with no selection. Know that you could always be that decisive Factor. Are you impatient or in a rush to know the results as no majority has been reached yet? No worries. Just hit "Close Votes" on the top right. First, you vote on date and location. Once majority is reached, the host submits time for you to vote. Once you vote on times and majority is reached, your event becomes final in the "Planned" section of your inbox. Your final event has now been decided. Tap on the bottom to let others know you are coming or tap it twice to let them know you can't. Tap the button to automatically add the event to your phone's calendar. Tap the picture/map to automatically get directions to your final destination in maps. Something went wrong and you need to cancel the event? No worries. Just hit "Cancel Event" on the top right. Stay updated with our latest news by following one of our social media accounts. Copyright © 2016 PlanItUp Inc. All rights reserved.